This month, a special kind of sliced apple will go on sale at select US supermarkets, and thanks to CSIRO research these apples won’t turn brown when they’re cut, bitten or bruised. Arctic® apples, have been developed by Canadian biotech company, Okanagan Specialty Fruits Inc. (OSF). OSF is the first company to license CSIRO’s non-browning technology. 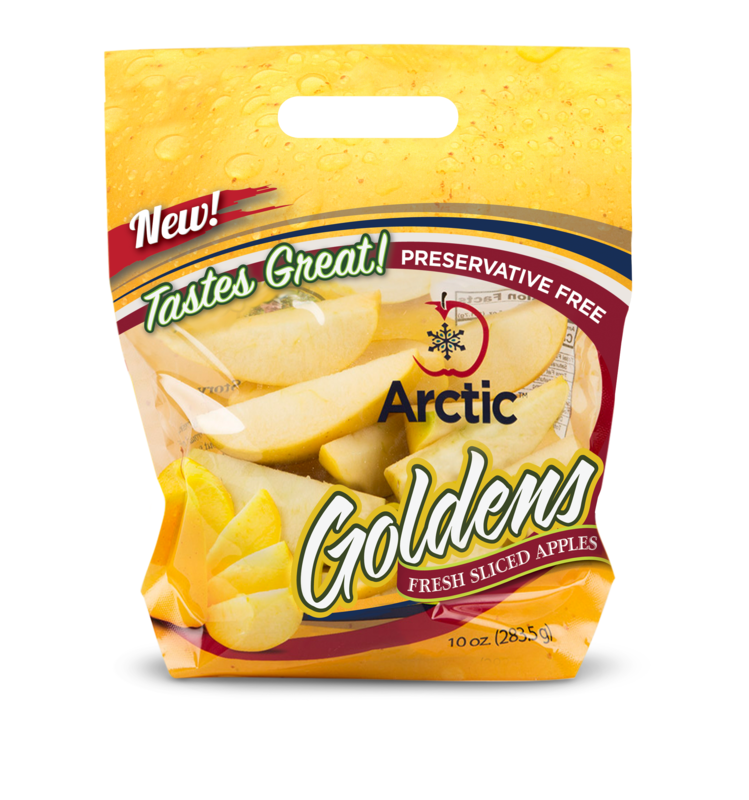 Their first product will be snack-sized bags of fresh Arctic® Golden apple slices, with more non-browning varieties expected in future years, including Granny Smith and Fuji. Company founder Neal Carter began working on the apples in the mid-1990s. “I came across research from CSIRO that had managed to ‘turn off’ browning in potatoes,” Carter explained. “As an apple grower, I was very aware that apple consumption had been declining for decades while obesity rates had simultaneously been sharply rising. “My wife and I felt that we could help boost apple consumption through a similar biotech approach with apples, as non-browning apples would be more appealing and convenient. “We felt this could also significantly reduce food waste, as nearly half of all apples produced end up wasted, many due to superficial bruising,” he said. While there may be other sliced apple products already on the market, these are often coated with vitamin C and calcium to prevent browning and to preserve crispness, and this can change their taste. 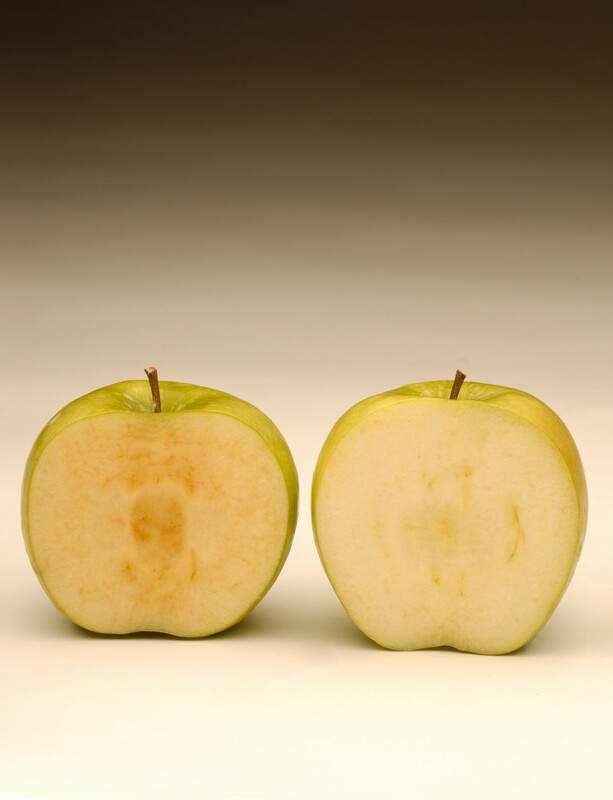 Apples and other fruit and vegetables turn brown after they are cut or damaged because of a naturally occurring enzyme (polyphenol oxidase or PPO) that reacts with other components in the fruit cells when these cells are ‘broken’, producing a brown pigment. CSIRO scientists constructed an anti-PPO gene which, when inserted into plants, blocks the production of PPO and therefore stops the browning. Spoilage due to browning costs food processing industries worldwide millions of dollars each year in wastage and costly chemicals to prevent the reaction. This non-browning technology has potential to reduce waste not only in apples and potatoes but also in other important horticultural crops, such as beans, lettuce and grapes where produce with only small injuries could still be sold. The reason apples and other fruit and vegetables turn brown after they are cut or damaged is because of a naturally occurring enzyme (polyphenol oxidase or PPO) that reacts with other components in the fruit cells when these cells are ‘broken’, producing a brown pigment. You can destroy the PPO enzyme through cooking, and reduce enzymatic browning if you cover fruit, such as with cling wrap. Another popular option to reduce browning is to put lemon juice on fruit. This works because the ascorbic acid in lemons delays the PPO enzyme reaction. CSIRO scientists took a different approach to stopping browning. First, they managed to isolate the genes that encode the PPO enzyme. Then they constructed an anti-PPO gene. Inserting this gene into plants blocks the production of PPO and therefore stops the browning. Ian Dry and Simon Robinson were the two CSIRO scientists working on this project in the 1990s. “We heard about a naturally occurring Sultana grapevine mutant that produced sultanas that were light golden in colour instead of dark brown and we tried to find out why,” Dr Dry explained. “We discovered the sultana was light in colour because of a mutation in the grape PPO gene. “It was then that we realised the potential of this discovery to be applied to other fruits and vegetables. “We tested anti-PPO technology on potatoes and managed to produce Australia's first non-browning potato,” he said. The anti-PPO gene in the apples does not come from another species. It is made from DNA sequences from four of the apple’s own genes, and insertion of this anti-PPO gene is aided by commonly relied upon biotech tools. Arctic® apples will be sold through select US outlets beginning in October 2017; while there is limited supply this year, as plantings mature resulting in increased volume, sales will expand throughout the U.S. and Canada.